First off, a status update: we will not be releasing Alpha 44 this week. We will do an Alpha 43C at some point, and will aim to do Alpha 44 next week. This is due to a number of non-work factors, and we apologize for being a little out of sync. Alpha 44 will be better for it. Last time I wrote a blogpost, I noted that we were redoing the barracks to use a new user interface. Well, the interface code was written, but disabled, because we needed to set the AI to use all the new goodies (and, also, to make sure that we fix some of the long-standing military bugs that make our soldier friends less than effective.) The issue here is that we have a big block of decision tree code which should drive military decisions, as well as your hierarchy of Maslowian needs. Right now, this code doesn’t really have a unified mechanism; there is a big block of code that is hard coded for colonists which evaluates their military tree, and that’s sort of a big ugly mess. There needed to be a mechanism to evaluate a decision tree – a series of requirements and “do I succeed at this requirement or do I fail at this requirement?” decisions, which we can run through consistently and without touching the scripting system. I planned on doing this – and even blogged about it! – a few months ago, but kept putting the rewrite off because I knew it was going to be terrible, and because there we always other things that needed to be done first. Anyhow, I finally ran out of things I could meaningfully do before doing this horrible rewrite, so I finally said “ugh” and started in on it. Output of the game on the Intel HD4000. Things are afoot. As part of these things, we have had to do a few things that we have been putting off for awhile now here at Gaslamp HQ. One of these things is fixing pathing so people do not walk through each other; the other, which is what I have been working on, is a thorough shakedown of the building code. As long-time readers are no doubt aware, one of our interesting pieces of technology is the code for procedural buildings. In Clockwork Empires, you designate a building footprint, feed it some style information (“brick walls and gabled roofs, please!”) and the engine churns out a building to your specification. There is significant Technical Devilry in our building code to do this, as it is a fairly hard problem to take somebody’s blueprint and get a building out of it. 4. “Good” edge beveling for roof flashing. What this means is that when a roof faces the player, and has complex geometry, we should bevel it appropriately. 5. A litany of other, minor artist complaints. Accomplishing all of these things requires a certain amount of very tricky programming, and some very skilled debugging. How do you debug an exploding roof? Late breaking news from the Clockwork Empire, delivered by heliograph: The Empire is Shutting Down! Yes, at the behest of the thrice-damnable Whig Party, the iron gates of the Panopticon are shuttered, the Lord Palmerstoke Institute for Structurally Interesting and Extremely Sensitive Science has turned off the fumic extractor, and the mysterious clicking noises at the Empire Times are getting louder as the Editorial Board reviews its position on the events of the day. The Prime Minister is furious – all of this over the new healthcare plan, which his political enemies decry as Novyrus-Style Medical And/Or Beard Care. False rumours abound that a stout worker cannot choose his or her barber/chirugeon any more, and that death panels have been instituted to ensure that people die by any means necessary. Big, steaming government, encumbered by needless machinery, is interfering in the relationship between a doctor, his patient, and his leeches. Lies, we tell you! Lies! This brings us nicely to a Technical Status Update – what’s new this month? 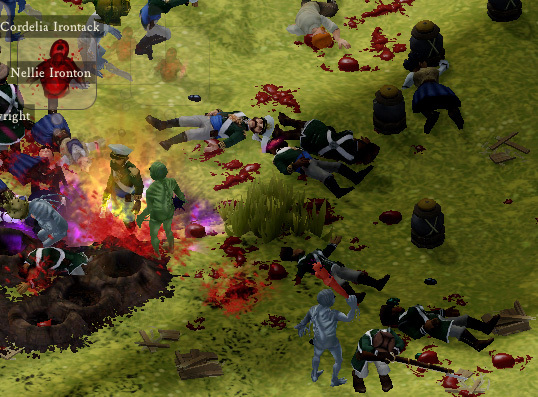 And how are the brave folks of the Clockwork Empires handling this upheaval? Things are slowly coming together. Some new developments have occurred in programmer town, and we are delighted to finally show you what we spent the past month-and-a-half doing.